Confidence is the cornerstone of success. It is the crux, linchpin, and bedrock of achieving the goals we set. Without confidence, success will crumble like a building without a solid foundation. Self-confidence is an attribute that every leader knows is essential to winning. Whether your confidence is overtly demonstrated, or presented with a quiet, but firm posture; it is a prerequisite for moving to the head of the pack and taking charge. Confidence is serious business – and it is quite often displayed as such: thoughtful, pensive, and humorless. Typically, you expect confidence to be reflected in an imposing and earnest manner, or with a formal and staid disposition. While that is the norm most of the time, building confidence requires belief in your dreams, plans, ideas, and a bounty of composure. For leaders and those who have achieved success, every – and any – slip or fall opens the door to opportunities for critics and naysayers to taunt or tease them; making a mockery of their ideas, tear down or take jabs at their accomplishments. 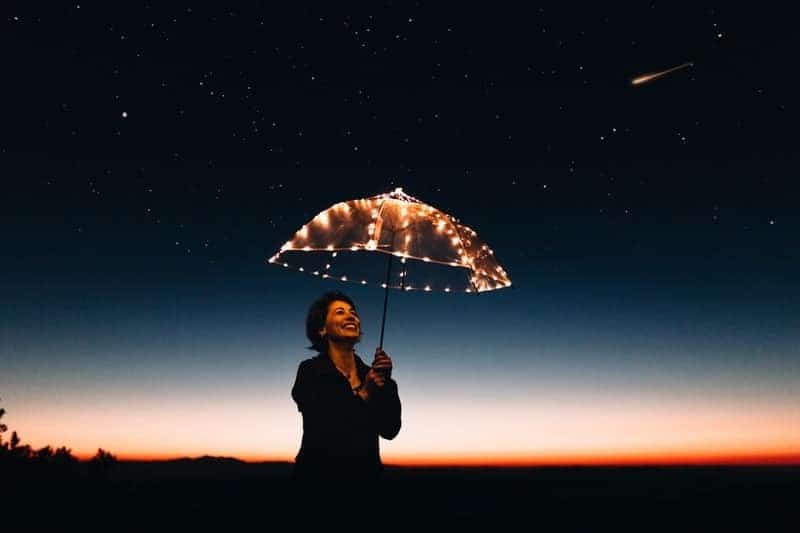 True confidence steps to the forefront in times of trial – when you have a crisis, when you are being challenged, and when you are being ridiculed. 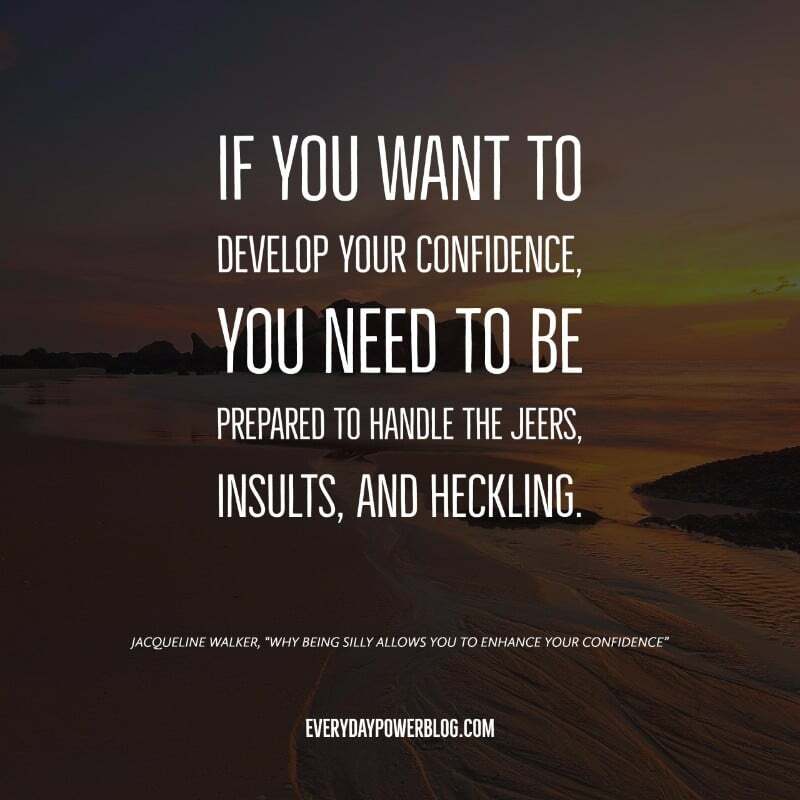 If you want to be leader, if you want to achieve success, and if you want to develop your confidence, you need to be prepared to handle the jeers, insults, and heckling. ONE method for developing your self-confidence is by channeling a stand-up comedian reacting to a negative audience. You need to act silly every now and then. Take the come-backs from your so-called silly behavior. 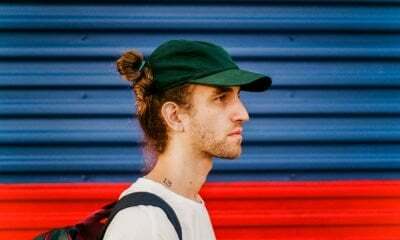 Learn how to feed off the taunts and mocks to enhance your self-confidence. Like many comedians, you need to get really good at taking those licks. Practice by just being silly every now and then. 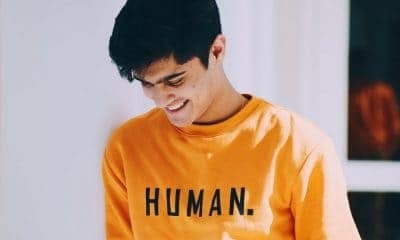 As you do, you will find that this allows you to relax, interact, and connect better with others. It can also help strengthen your resolve (develop a thick skin). This will advance your ability to be more assertive and courageous. You will begin to walk, talk, and perform with heightened confidence. Humor and laughter have a way of relieving stress, resulting in tremendous calm and relaxation. When you are relaxed and free from anxiety, your self-confidence rides at a high level. Being silly, laughing at yourself, or sharing a joke with friends and acquaintances have the potential to greatly enhance your self-esteem. Humor also helps to bring you closer to others because it lets others feel comfortable around you. 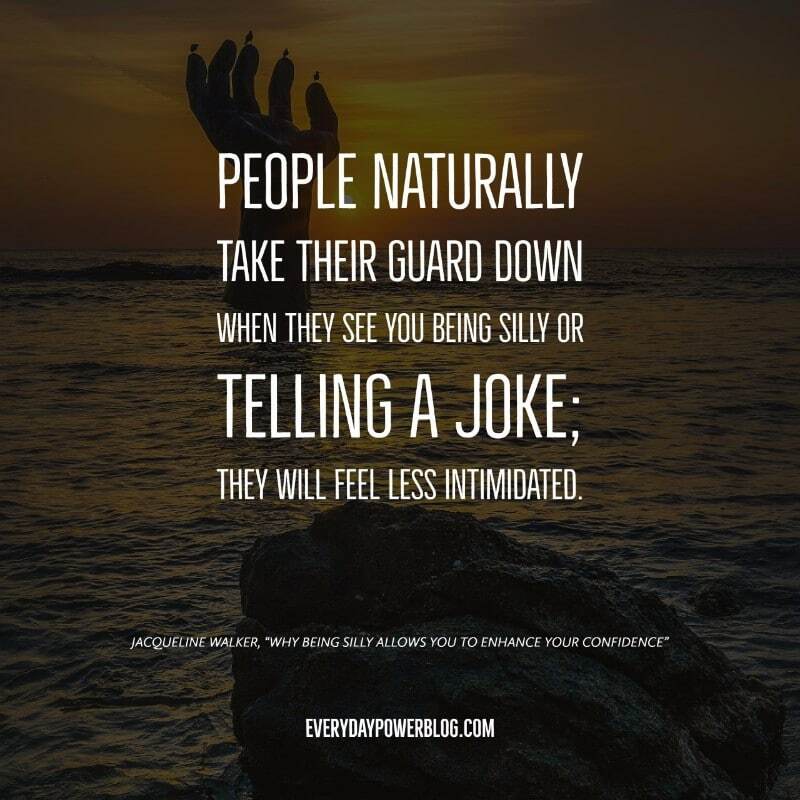 They naturally take their guard down when they see you being silly or telling a joke; they will feel less intimidated. You will find that others are more willing to interact and connect with you. Most everyone likes to laugh and wants to be happy. So your willingness to be silly helps to lighten the mood, eliminate tension, and bring others closer to you. The attention you can glean from humor can make you more popular, because it can widen your circle of friends and acquaintances. This can lead to better networking. 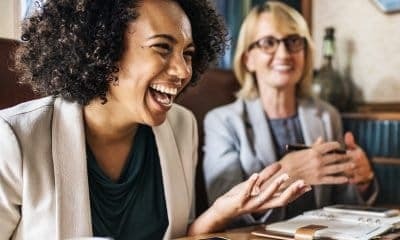 Think about it: when we must sit and listen to speeches or presentations, many times, the ones we are most likely to recall are those where some form of humor was infused. Presenters realize this. So they use humor and act a little silly when necessary to connect with the audience. Being silly helps you nurture skills that grab attention, bring a smile and joy to others, calms and comfort your inner being, and prepare you to proceed with confidence. As a leader, you expect at some point to be challenged and even taunted by others. If you are able to build your resolve to accept any and all types of feedback – especially when it’s negative – you not only elevate your confidence, but you position yourself to deal with obstacles that threaten your ability to succeed. Voluntarily acting out and being a little silly allows others to laugh at you – while you also laugh at yourself. This is a great tool for building a strong confidence level that doesn’t allow any act or comment to tear you down. If you become comfortable laughing at yourself, you will be happy in your own skin. You’ll be less likely to let others break your confidence or destroy your work. When others laugh at, tease, and ridicule you, it will become easy to simply shake it off and continue pursuing your goals. You will be free from fear and from being overcome by embarrassment and shame. Being a little silly every now and then is a great way to establish jaws of steel that can withstand any jab or punch thrown at you. When you are able to take criticism and feedback, able to be made a mockery of and still hold your head high, you are ready to push forward towards your dreams and grab success. 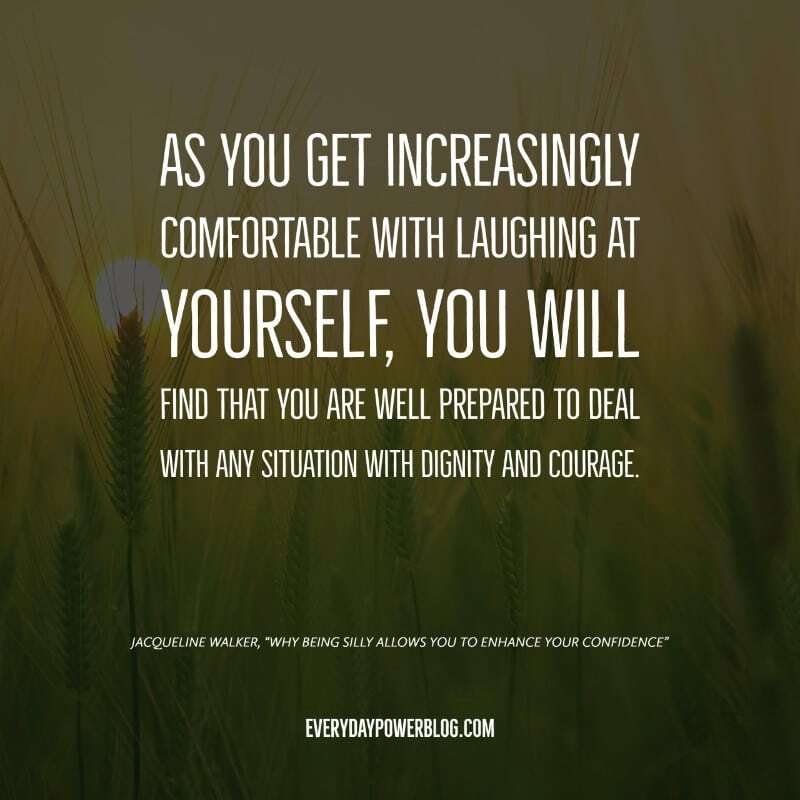 Self-directed humor and the willingness to show your vulnerability by being a little silly will prepare you to deal with challenges and insults that are bound to come as you strive to achieve. So, laugh at yourself; cast off the formality for a moment or two. Give others an opportunity to laugh at you. As you get increasingly comfortable with this, you will find that you are well prepared to deal with any situation with dignity and courage. You will become quite confident at delivering your message to people from all walks of life. You will be prepared to deal with a variety of scenarios and circumstances. You will continue to exude confidence at those times when you have no control of the situation. You will also be ready for those times when you didn’t expect to be laughed at. You must stand tall and perform in order to meet your goal and find your success. You must quickly shrug off the hecklers and take charge of the situation. Like any great comedian, you need to master timing, quick thinking, and have a stiff chin to perform confidently. Every great comedian knows that being silly, letting your guard down, and allowing others to laugh at you requires a healthy dose of confidence. So, as you strive for success, loosen up! Laugh at yourself, and learn to roll with the punches when others laugh at you. If you let go, you will find that there is power in being silly. Silliness will become a shield of protection that elevates and enhances your confidence to deal with anything that attempts to break your determination.